Comptroller Scott Stringer said Thursday that the nonprofit Mayor Bill de Blasio created to advance his political agenda was a "slush fund." MORRIS HEIGHTS — Comptroller Scott Stringer said Thursday that the nonprofit Mayor Bill de Blasio created to advance his political agenda was a "slush fund." 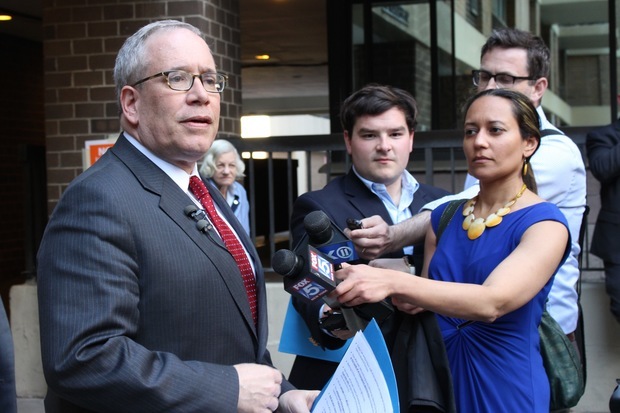 Stringer, speaking at a press conference where he unveiled an audit that showed the city gave out $60 million in improper senior citizen tax breaks to the deceased and corporations, also said the mayor was hurting the city's efforts at campaign finance reform. "This slush fund should have never have been constituted. I think it does not work for this city and I think we need to enact strong rules," Stringer said. A ruling Wednesday from the Campaign Finance Board said that the nonprofit de Blasio created, which could accept unlimited amounts of cash and had no disclosure requirements, did not violate election laws. The group, the Campaign for One New York, raised money from individuals, lobbyists and companies, many with business before the city, to tackle the mayor's effort to get universal pre-K and enact an affordable housing plan. Federal authorities are now probing whether donors received any favors in return for giving. The Campaign Finance Board called for the City Council to enact laws to bring donation limits to nonprofits aligned with politicians more in line with city election rules. The mayor praised the board's decision regarding whether the nonprofit had violated any laws. "I agree with their assessment that no law was broken and this was done appropriately," de Blasio said. But he blasted Stringer's criticism. "My reaction is he doesn't know what he's talking about," de Blasio said. The purpose of the nonprofit was to "achieve goals that are needed for the whole city like pre-K and affordable housing," the mayor added. "He's missing the point." The Campaign for One New York, which was run by political operatives to the mayor's campaign, also paid those same operative millions of dollars for their work. Calling the city's matching funds public financing program a "model" for the nation, Stringer, often counted as a potential de Blasio challenger in 2017, dismissed the mayor's reasons for needing to raise money. In addition to the moral argument the mayor made about the purpose of raising the funds, de Blasio also said he needed to raise the money to counteract those opposed to his agenda. "I've never felt that the way to govern is to set up a slush fund and think it's in the best interests of the city," Stringer said. "I think that the rebuke is appropriate and I think it's also a warning to elected officials that you should stay and play by the rules." Stringer also hit at de Blasio's arguments that he followed existing laws. De Blasio said that he voluntarily disclosed donors to reporters. "This is where the line should be drawn: Any political activity that the sources of the funds are not disclosed, watch out," de Blasio said. But the Campaign Finance Board criticized the mayor's nonprofit for a lack of transparency for not disclosing their reports on a publicly available website. DNAinfo New York also reported that the group has failed to name some of its contributors. "And the standard should not be whether you broke the law. The standard should be what's the best practice for conducting political campaigns," Stringer said. "Campaign finance is under attack throughout the United States. We are the model and anybody who tries to hurt or harm that model, I think should stand down," he added. In addition to the mayor striking back at Stringer, de Blasio's former campaign manager Bill Hyers took to Twitter to criticize Stringer, saying he was "taking shots from the cheap seats yet again" and referencing a Stringer audit of universal pre-K contracts, which raised issues just before the effort launched in 2014. Hyers was chairman for the Campaign for One New York and his company, Hilltop Public Solutions, was paid more than $200,000 in fees by the nonprofit in 2014 and 2015.